Jeff Spencer (right), environmental quality specialist with Michigan's Department of Environmental Quality, presents award to Robert Hunt, grounds manager at Hope. 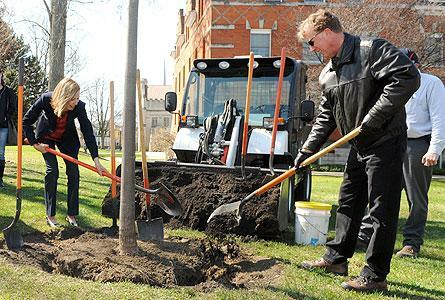 Hope College received statewide recognition for its environmental stewardship during a planting of a young tree to replace a 160-year-old elm that was lost to a storm. Hope is being certified by the Michigan Turfgrass Environmental Stewardship Program (MTESP), culminating an extensive, multi-year review of the college’s grounds management practices. The certification was presented on Tuesday, April 22, on the front lawn of the President’s Home, when Hope planted a Princeton elm during a ceremony scheduled in conjunction with Earth Day. Participating in the ceremony were Adam Ikamas, MTESP program director; Jim Johnson, director of environmental program for the Michigan Department of Agriculture and Rural Development; Jeff Spencer, environmental quality specialist with Michigan's Department of Environmental Quality, who presented the award; and Robert Hunt, grounds manager at Hope. The new tree’s predecessor was an American elm that was destroyed during a wind storm on July 11, 2011, that uprooted or snapped trees and power poles throughout the Holland area with gusts reported at 80-90 and even 120 miles per hour. Its age estimated at more than 160 years, the fallen tree predated even the chartering of Hope in 1866. Hope has an on-going tradition of planting a tree on every Earth Day and Arbor Day. Spread across 150 acres, the Hope campus has more than 2,000 trees. The MTESP certification recognizes an even deeper commitment to environmental stewardship through overall grounds management practices. As part of the certification, an environmental action plan is established during a site visit conducted by program staff and the grounds superintendent. The action plan is used as a management tool to prevent potential threats from negatively affecting natural resources, with a special focus on the protection of groundwater. Considerations range from how the organization stores pesticides and fuel, to how equipment is washed, to the presence of buffer strips along drains. Hunt noted that Hope valued the opportunity to work with MTESP across the past three years to achieve the certification. MTESP began with a focus on golf courses, but has since expanded to include other organizations, with slightly more than 80 total having achieved certification. Hope is the fourth college or university in the state to have earned the designation. MTESP developed at Michigan State University with support from the Michigan Turfgrass Foundation, Michigan Golf Course Superintendents Association, Golf Association of Michigan, Michigan Golf Course Owners, Michigan PGA, Michigan Department of Environmental Quality, Michigan Department of Agriculture and the Michigan Department of Natural Resources. The Michigan Groundwater Stewardship Program has provided the base funding to develop the program. The President’s Home is located at 92 E. 10th St., between College and Columbia avenues. A temporary dining pavilion outside of the DeVos Fieldhouse highlights the approach to a major renovation this summer of the Phelps Hall dining hall. Soprano Sarah Ashcroft, a 2011 Hope College graduate and Holland native who is now pursuing graduate studies in music at Eastman School of Music, will perform at Hope on Saturday, April 26, at 7:30 p.m. in Dimnent Memorial Chapel.